In celebration of APIA Heritage Month, we’ll be running a special Poetry in History series once a week in lieu of our Friday prompts. For each post in the series, we’ll highlight an important period in Asian American history and conclude with an idea that we hope will provoke you to respond. 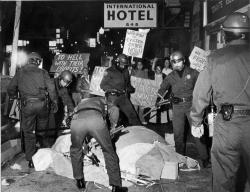 Today’s post is about the fraught history of the International Hotel in San Francisco’s Manilatown. Manilatown itself becomes a ghost with a cavity in place of the organ that was the I-Hotel, which by the end of the poem is revealed to be a type of inverted sanctuary, inhabited by “ghosts and discarded things,” made remarkable for its absence — its existence etched out in the negativity of its space, the way that it tunnels into the earth rather than rises up from it. Like Reyes, Gotera returns to the site of the hotel so that, by the end of the poem (excerpted above), we see that the building frames the speaker’s life. Gotera, however, not only leads us to excavate the tricky space of memory, but inhabits it, taking on the persona of a manong. For Gotera’s speaker, the I-Hotel is not simply a building — its shape and height, the textures of its walls and furnishings, the things that gave it physical definition — define him as well: “This room’s all the home / I got,” he says earlier in the poem, and “Look around you. This is all there is.” The act of remembrance, then, becomes almost sacred in light of this: in choosing to remember the building, its individual rooms, the reader or listener participates in the preservation of a community’s historical narratives, working against the vacuum created by the hotel’s destruction. 1. Write a poem that centers around the negative space of something that has been physically lost — an erasure, an absence, a black hole, a pit, a wound, or scar in a body. Investigate its textures, making use of the tools of craft (such as form and image). How might that space be envisioned as a kind of world? What new iterations of memory and narrative might entering into that space produce? 2. Write a poem that enacts the preservation of an important voice or event by means of revisiting a geographical location or physical structure. Play with the slipperiness of time: how might that place, as it is remembered, differ from the nature of the place, in the present, and how might the memory of that place have, itself, evolved, over time? Choy, Curtis. The Fall of the I-Hotel. 1983 (revised 1993 and 2005). Returning a Borrowed Tongue: An Anthology of Filipino and Filipino American Poetry. Ed. Nick Carbo. Coffee House Press, 1995. Reyes, Barbara Jane. Poeta en San Francisco. Tinfish Press, 2006. Robles, Al. Rappin’ With Ten Thousand Carabaos in the Dark: Poems. University of California, Los Angeles, 1996. Yamashita, Karen Tei. I-Hotel. Coffee House Press, 2010. Habal, Estella. San Francisco’s International Hotel: Mobilizing the Filipino American Community in the Anti-Eviction Movement. Temple University Press, 2008. Robles, Anthony D. (Ill. Carl Angel) Lakas and the Makibaka Hotel. Children’s Book Press, 2006. Hi folks, thanks for this. I also wanted to add that Tony Robles himself is an author whose books for young readers (published by Children’s Book Press) deals with the I-Hotel. Thanks for the information, Barbara! I’ve updated the list of resources to include his book.